Saudi Arabia's spring MERS surge continues, as we've seen new cases announced for 11 days in a row. So far, 35 cases have been reported in the month of March, with the bulk of those (n=21) coming from a cluster in and around Buraidah. The (largely, but not exclusively) nosocomial Buraidah cluster continues to expand today with the addition of a 33 y.o. male expat listed in critical condition whose exposure is `under investigation'. A second case today, this time from Hail, is a 60 y.o. male in critical condition, whose exposure is also listed as `under investigation'. Yesterday we saw another case from Hail (M,48) listed simply as a `primary exposure'. `Primary cases’ are those that occur in the community when there is no known exposure to a health care facility or to a known human case. 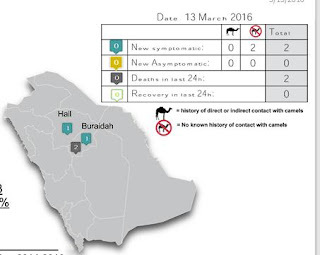 The MOH also reports two more deaths from the Buraidah cluster, which seems to be deadlier than usual. So far 9 of 18 symptomatic cases have died, including 4 patients in their 20's. Nearly all have been listed as having (undefined) pre-existing illnesses, and this may well be contributing to the elevated mortality rate. 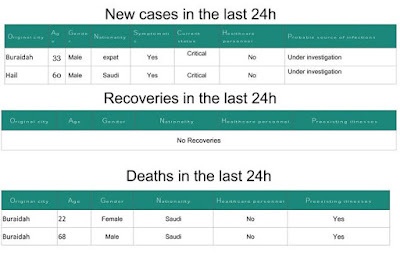 Hopefully we'll get more details when the Saudis report these cases to the WHO.